This lesson will show you how to link from one lesson in a manual to another lesson in the same manual. You can only link between lessons that are in the same manual. Select the text that you would like to link from. 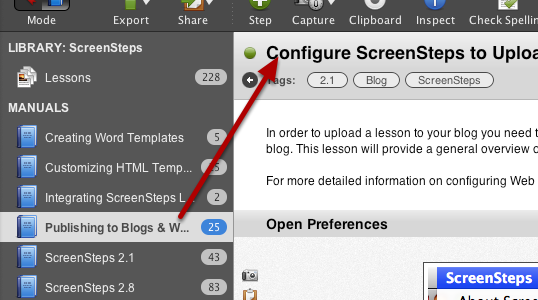 In the Link dialog that opens select the Manual Lesson tab (1). Next, select on the lesson you would like to link to (2) and click OK. The text will now link to that lesson. If you hover over the text then the name of the lesson the text links to will appear as a tooltip. If you CMD + click the link on Mac, or ALT + click the link on Windows while editing the manual lesson then the lesson the text links to will be opened for editing. Thanks for releasing this much requested feature! I can't wait to give 2.8 a spin. Great product. Is it possible to insert HREF-anchors in a lesson which are available in a HTML-export? I am preparing a manual for a program of us and could use some links to details inside a lesson for context-help. I am not sure what you mean by working for the export destination. Can you clarify? You can't edit id tags directly for steps, but they are automatically added to the step HTML output. You would need look up the id you need for the file you are linking to and build the link yourself. If you find you are having to do a lot of that though you should probably be splitting you your lessons into smaller segments. The idea is to have a lot of short lessons, not just a few long ones. Having a bunch of smaller lessons makes the linking between lessons work much better. Can you please add a feature where text can be linked to within the document (e.g., bookmarks)? It helps for jumping between long lists. @Theresa - linking to steps within a lesson is a feature we are considering for a future version. Also, is it possible to create a link in a lesson to another lesson not in the manual, and when you export it show it as plain text. @Nathan - I'm not sure I understand what you mean by showing it as plain text when you export. Can you explain? 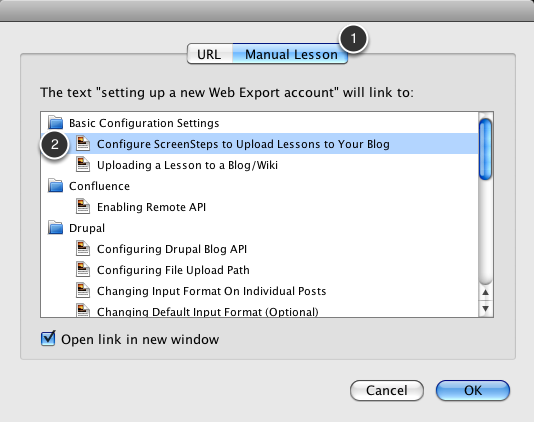 You can't link to a lesson not in the same manual and have the link resolved when you export. You have to use a URL. I agree with Theresa as well.